Easter Robins! So beautiful! This book is absolutely beautiful as well! Perfect for any Easter basket or story time, you don’t want to miss this little book! With Easter fast approaching, this book has come out at a perfect time!Â The story is adorable and sweet and even teaches us a few Dutch traditions.Â The illustrations are very well done and a sense of love is emitted from each and every page. Written for children ages 4-8, I think this book is perfect for Easter baskets and to keep on the bookshelf to re-read all year long! In the center of the nest lay one perfect egg, the color of a spring sky. The father robin sat on a branch nearby, guarding his family. Tressa spotted raccoon tracks below and a blue jay eyeing the nest. âWeâll have to leave that one to the Creator,â Gran said. Robins have built a nest on the window ledge at Grandmotherâs house! Tressa is thrilledâand concerned. What will happen to the sky-blue egg laid by the mother robin? As more eggs appear, Tressa witnesses the daily drama of the robinsâ nest and learns how God cares for all creatures. Besides watching the birds, there are Easter eggs to color. And there is a very special story to hearâa tale of long ago about one small bird with a very big heart. How did the robin get its red breast? Tressa is about to find out as Gran tells her the story of the Easter robin. 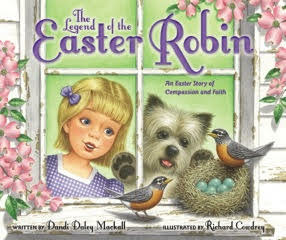 Brought to life with colorful, tender illustrations, The Legend of the Easter Robin will captivate and teach your child about compassion and faith. For Easter, we always go to church and come home for a nice home-cooked meal. It’s a good time to be with family and friends.